1892 – Bankers adopted their Bankers’ Manifesto of 1892 in which it was declared: “We [the bankers] must proceed with caution and guard every move made, for the lower order of people are already showing signs of restless commotion. Prudence will therefore show a policy of apparently yielding to the popular will until our plans are so far consummated that we can declare our designs without fear of any organized resistance. The Farmers Alliance and Knights of Labor organizations in the United States should be carefully watched by our trusted men, and we must take immediate steps to control these organizations in our interest or disrupt them…. The courts must be called to our aid, debts must be collected, bonds and mortgages foreclosed as rapidly as possible. 1907-1917 – In order to warn Americans, the1892 Bankers’ Manifesto was revealed by US Congressman Charles A. Lindbergh, Sr. from Minnesota before the US Congress sometime during his term of office between the years of 1907 and 1917. 1910 – John E. DiNardo, professor of public policy and economics at the University of Michigan, writes in his article “The Federal Reserve Act”: “On the night of November 22, 1910, a small group of surrogates of the most powerful bankers of the World met … under the veil of utmost secrecy. Over the next few weeks these men would perpetrate, under the orders of their masters, … perhaps the most colossal and devastating fraud ever inflicted upon the American People. If you have the deed to your home, look at it. You are called tenant, not owner. THE DEBT CRISIS IS THE BEST THING THAT HAS HAPPENED! The debt crisis is the best thing that has happened in a very long time! Why? Because it woke up the world, especially Americans. We gazed in astonishment as the myriad foibles of the USA, Inc. unfolded. The truth spilled out, covering the halls of our government in a murky, gluey maze of ideologies, egos, and obedience to demigods. The people—those for whom our Declaration of Independence proclaims: “We hold these Truths to be self-evident, that all Men are created equal, that they are endowed by their Creator with certain unalienable Rights, that among these are Life, Liberty, and the Pursuit of Happiness”—were nowhere to be seen. Unalienable or inalienable rights = Rights granted by Creator God—Rights that cannot be taken away. For this very reason, Americans have suffered through the many defacing acts of the USA, Inc. perpetrated upon our constitutional government. With the 2011 debt crisis, our sleepy acceptance of evils that are sufferable reached its saturation point and jarred us awake and ready to take action. But, first, we must put aside devisive ideologies (including religions), political party affiliations, allegiance to demigods, egos, competitiveness, and the mistaken concept of the survival of the fittest that has allowed us to close our eyes to very corrupt business practices. We must educate ourselves concerning the systemic reasons that have created and perpetuated the chaos in which we live. Why do we have a debt crisis? As a citizen of the constitutional republic of the United States of America, I present my views with no claim to being a professional economist, constitutional expert, or historian. I do, however, accept my responsibility to hold the only permanent office within the United States–that of Citizen of the United States. As a whole, Americans know next to nothing about our constitution or our history. This ignorance allows for all sorts of lies and misconceptions to be accepted as truth. In defiance of this Constitutional mandate, Americans have allowed religious based ideologies to determine their selection of Congresspersons and President, regardless of that person’s capacity to govern in a way that ensures the inalienable rights of “Life, Liberty, and the Pursuit of Happiness” for all citizens. John E. DiNardo, professor of public policy and economics at the University of Michigan, writes in his article “The Federal Reserve Act”: “On the night of November 22, 1910, a small group of surrogates of the most powerful bankers of the World met, under the veil of utmost secrecy, at specific little-used tracks of the railway station in Hoboken, New Jersey…. Over the next few weeks these men would perpetrate, under the orders of their masters (men such as the Rothschild, Rockefeller and Morgan bankers) perhaps the most colossal and devastating fraud ever inflicted upon the American People. In violation of the US Constitution, the Federal Reserve prints Federal Reserve Notes, which we call dollars and use as money. In actuality: “The Federal Reserve Notes in question in this case are unlawful and void upon the following grounds. 1. Said Notes are fiat money, not redeemable in gold or silver coin upon their face, not backed by gold or silver, and the notes are in want of some real or substantial fund being provided for their payment in redemption. There is no mode provided for enforcing the payment of the same. There is no mode provided for the enforcement of the payment of the Notes in anything of value. 2. The Notes are obviously not gold or silver coin. 3. The sole consideration paid for the One Dollar Federal Reserve Notes is in the neighborhood of nine-tenths of one cent, and therefore, there is no lawful consideration behind said Notes. 2/5/1969 Court Decision by Martin V. Mahoney, Credit River Township, Scott County, Minnesota. The raising the debt ceiling debacle included threats to the payment of Social Security and Veterans’ pensions, as well as income payments for active duty military. These threats were not only unconstitutional—they caused already stressed military families much anxiety over what would happen if they did not get paid on time. The elderly, many of whom are in nursing homes, feared they would evicted if they could not make their monthly rent payment. Because Americans know so little about our history, we have allowed ourselves to be the victims of repeated fraud. The best way to hide a fraud is to place evidence of it in plain view. A good example: Look at the deed for your home … you are referred to as the tenant, not the owner—whether or not you have paid off your mortgage. As the U.S. Senate document quoted above states: “Individual so-called ownership … amounts to mere user.” Tenants can be expelled for a variety of reasons. Because Americans know so little about our history, we are easily led into fights over matters that have no relationship to banking or governing a nation, such as: abortion, planned parenthood, gay marriage. As long as we fight each other over what amounts to religious ideologies, those who would perpetrate fraud upon us are free to do so in plain sight—as stated above in The Bankers Manifesto of 1934. So what is the good? A vital ingredient for the coming days—the attention of all Americans … the comprehension that our entire governmental and financial system is broken … the recognition that major changes are essential! We must let the old fall by the wayside and be receptive to the influx of the new. The new has been present with us for over a decade, hidden from view by the refusal of the old to let go. One such example is NESARA—the National Economic Security & Reformation Act. The panorama of NESARA extends back in time for over one hundred years and involves thousands of home and farm foreclosures. These foreclosures were a result of fraudulent bank practices instituted as early as 1892 with the 1892 Bankers Manifesto. NESARA grew from a national act (some maintain it was signed into law by President Clinton)—created to correct the grievous wrongs perpetrated on the American people by the banking industry, government, mega corporations, and the media—to a set of principles desired throughout the planet. 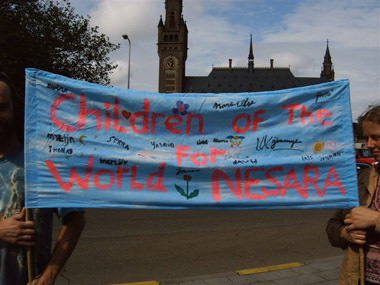 As a result of over 40 demonstrations in front of the Peace Palace in the Hague, Netherlands, NESARA became a universal structure within which improvements in every nation will take place. The photos below were made by the NESARA demonstrators, some of whom traveled from England and Germany to participate in one or more of the 40+ demonstrations in all types of weather. 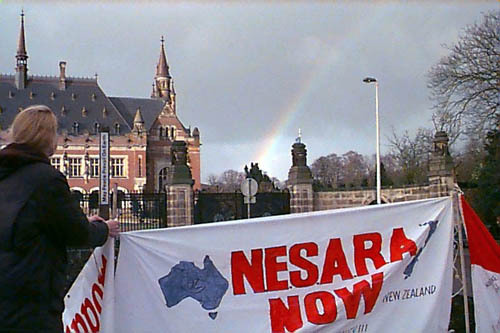 Visitors to the Peace Palace from throughout the world were given information on NESARA. 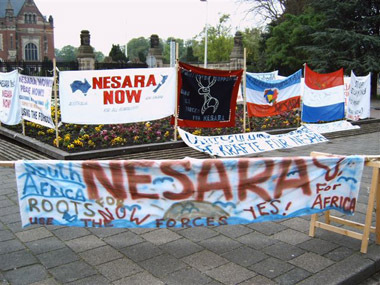 Many returned to their home country to form NESARA action groups. Demonstration for NESARA – A New Beginning! 1. Provides forgiveness of credit card, mortgage, and other bank debts as remedy for bank and government frauds. 2. Abolishes the IRS. Creates flat rate non-essential new items only sales tax revenue for government. 3. Initiates U.S. Treasury Bank system, which absorbs the Federal Reserve, and new precious metals backed U.S. Treasury currency. 5. Requires resignation of current administration to be replaced by Constitutionally acceptable NESARA President & Vice-President Designates until new election within 120 days. This allows for a totally new start. 6. Requires the President designate to declare Peace enabling international banking improvements to proceed smoothly; ends U.S. aggressive military actions immediately; and many more improvements. A major transformation is in store for us—a transformation in which life as we have known it will no longer exist. As we awaken to the fact that we are not alone in the world, our galactic family will openly appear among us in love and peace. Together we will begin the process of creating a galactic society. Very likely this process will include something like NESARA and a Department of Peace to get us started. As we ascend into higher consciousness, the limitations we presently accept as “that’s life” will disappear. Abundance in every way will be ours! NOTE: Because a question has arisen, I am including a copy of the Bankers Manifesto of 1892 and 1934. The correct wording may be the Bankers Manifesto of 1892 and its reaffirmation in Congress in 1934. “We [the bankers] must proceed with caution and guard every move made, for the lower order of people are already showing signs of restless commotion. Prudence will therefore show a policy of apparently yielding to the popular will until our plans are so far consummated that we can declare our designs without fear of any organized resistance. The Farmers Alliance and Knights of Labor organizations in the United States should be carefully watched by our trusted men, and we must take immediate steps to control these organizations in our interest or disrupt them. At the coming Omaha Convention to be held July 4th , our men must attend and direct its movement, or else there will be set on foot such antagonism to our designs as may require force to overcome. This at the present time would be premature. We are not yet ready for such a crisis. Capital must protect itself in every possible manner through combination [conspiracy] and legislation. When through the process of the law, the common people have lost their homes, they will be more tractable and easily governed through the influence of the strong arm of the government applied to a central power of imperial wealth under the control of the leading financiers. People without homes will not quarrel with their leaders. History repeats itself in regular cycles. This truth is well known among our principal men who are engaged in forming an imperialism of the world. While they are doing this, the people must be kept in a state of political antagonism. The question of tariff reform must be urged through the organization known as the Democratic Party, and the question of protection with the reciprocity must be forced to view through the Republican Party. In order to warn Americans, the1892 Bankers’ Manifesto was revealed by US Congressman Charles A. Lindbergh, Sr. from Minnesota before the US Congress sometime during his term of office between the years of 1907 and 1917. Filed under: 2011, 2012, America, Bankers, Bankers Manifesto of 1934, Citizen Rights, Coping with Crisis, Debt Ceiling, Debt crisis, Declaration of Independence - United States, Dennis Kucinich, Divine Plan, Enlightenment, Extraterrestrials, Financial Crisis, Forgiveness, Full Consciousness, Gaia, Government, Legislation, NESARA, Our Galactic Family, Peace, Politics, Unity |	Comments Off on THE DEBT CRISIS IS THE BEST THING THAT HAS HAPPENED! THE GOAL – TRANSITION TO OUR NEW WORLD TO BE COMPLETE BY AUGUST, 2019!